We are renting, and a small section of the backyard fence (around 3 and a half feet width) is shorter than the rest of the fence. 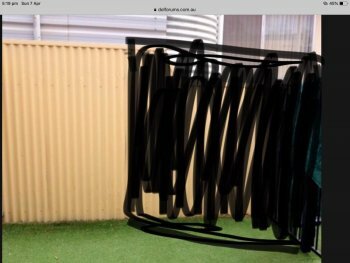 Any ideas on how to make that section of the fence taller, it has to be temporary as renting you can't alter anything. There is fake grass, so no dirt there to dig a post into. 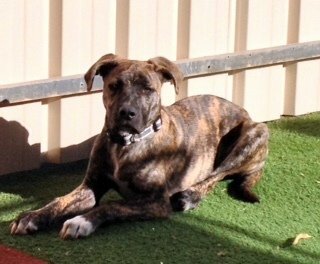 Im stuck on ideas, I had thought of some bamboo/brush type screening from Bunnings, but I'm worried he will chew it, as everything at the moment is chewable in his mind. Here's a pic of that area, the other fence is a pool type fencing which goes into the side yard, so we could attach something at that end. Does this make sense? A sort of cilp on base for a length of lattice ? I guess a carpenter/handyperson could help . There would need to be several clamps fastened underneath ..with light lattice . perhaps, if neighbours don't mind , attach clamps to that diagonal bit as well ? That would greatly improve stability . There are probably better ideas ... but that's what popped into my head Have fun!! how high is the shorter section? I wouldn't be rushing to add anything yet. Your pup is nearly 5 months old and just over a foot tall. He might not grow as much as you think. Hi Rebanne, The shorter section is 4 foot 6", the high section is 5 foot 10". So a fairly big size gap in that part. 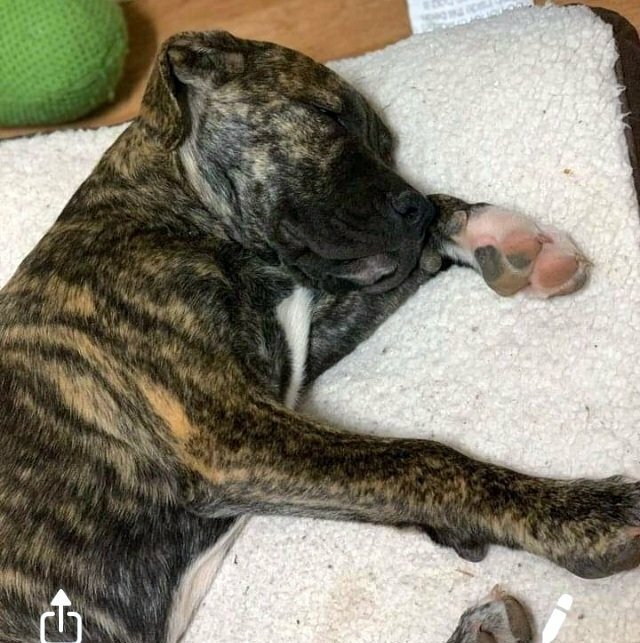 His paws are huge, and he's very long in the body, almost like a greyhound build but stockier, who knows what he will turn out like, have to wait and see. I wanted to put up something more as a visual deterrent now, as When he's left outside with a Kong or a bone, I look through the window to check up on him, and have seen him a couple of times jump up and put his paws on that part of the fence, like he's wanting to look over, but obviously can't as the fence is too high (for now). A large sheet of ply or lattice painted the same color as the fence. Having it from the ground to the height and shape you need it and tethered to the fences with clamps, zipties or similar. Bricks, potplans or a sleeper along the bottom to give it more stability and keep it right against the fence. Instead of going up how about going out? 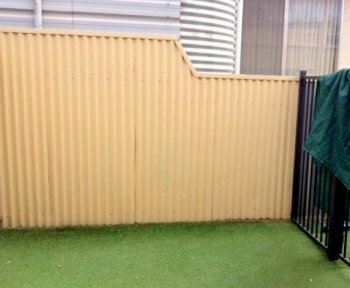 Piece of lattice or the Bunnings compost cage panels laid horizontal along the top of the side metal fence and resting onto the pool fencing. Not sure how to fix it to the metal fence, some sort of clamp maybe. Protruding into the yard by a couple of feet. Otherwise I like corrie's idea best. It would be more secure then something just attached to the top. 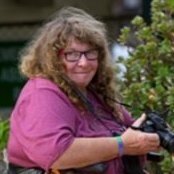 Is the agent/landlord approachable ? perhaps if you presented a nice neat plan of something which involved matching /complementing materials , but which only needed the odd tek screw ..and which would be done by a tradesman ...perhaps they would consider it ? oh wow ... he will be a real looker in a few months' time !! @corrie I like the idea of lattice from the ground up. I have some nice concrete pots as well as some pavers that would do the bottom, and can find the best way to attach it to the fence without it looking too obvious. I think the paint will be easy enough to match up. I might hang some small pot plants from it, or decorate it with something (once he grows out of his crazy puppy ways of everything is there to be chewed, jumped on, and played with). Thanks for the suggestions. 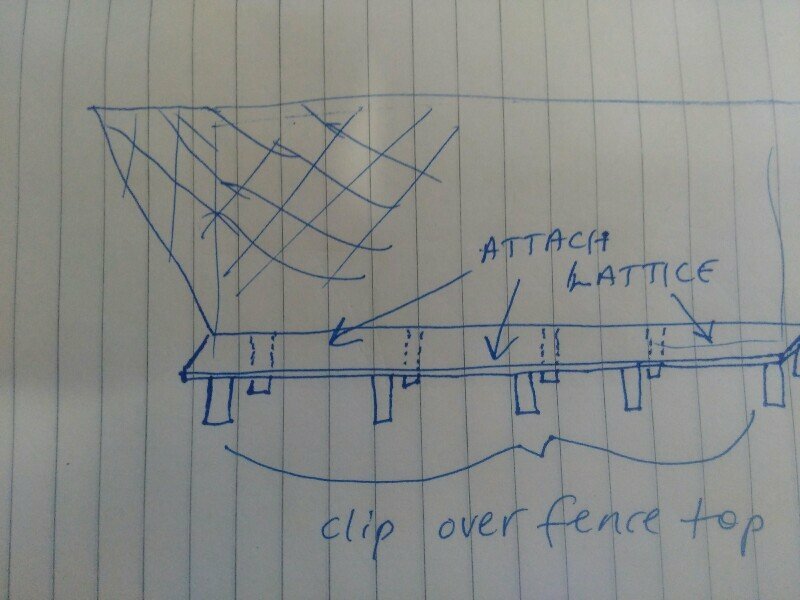 Another one I hadn't thought of, thanks for the suggestion, but I agree, I think the full length lattice would be more secure. Both the r/e agent and the landlord are approachable, but it would mean getting permission from the neighbour as well, which makes it all a bit more of a hassle than I want, whereas it just being a temporary thing of my side of the fence is all okay. And thanks Perse, he's getting more handsome each day. 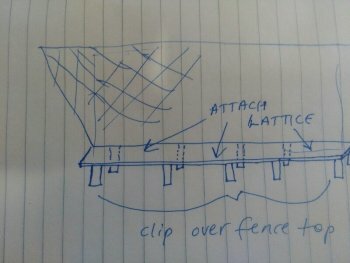 Instead of extending the fence, I’d block off the whole corner with some board of fencing panel or similar, the same height or higher than the existing fences. You can tie it to the pool fencing easy enough, and sit the other side in one of the lows in the iron fence, which will brace it somewhat. Sit something heavy along the inside bottom to prevent pushing. But it should naturally brace itself into the corner if pushed . Hey - if you're going to put something up that's not fixed anyways, but hinder view, it would be neighbourly to sound them out anyways? And the landlord might even pay for it. It's such a simple attachment, they just slot in and you screw it in. When you take it off, you can take the slots out, and rescrew the screws in and leave the screws there so there's no holes. Another good suggestion, but it means I'd be losing that part of the yard, finding something big enough to fit it, and it will be more expense than I want to outlay to be honest. 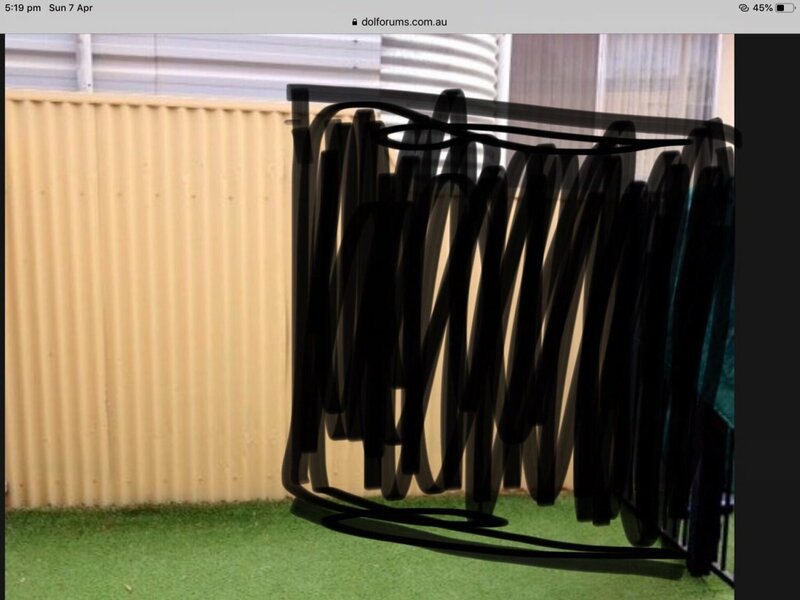 @PantoThe neighbours are a lovely older couple who I'm sure wouldn't mind what I put up (I'd still ask them though) as that's the side of their house which just has some water tanks (which are ugly to look at from my point of view anyway. Do you mean put up a colorbond extension thingo Panto? it's strange it has been stepped down before the fence - I wonder if it is a council requirement? Back, side and front fences have different requirements when you're building.